Democratic representative Alexandria Ocasio-Cortez (N.Y.) and her chief of staff, Saikat Chakrabarti, were removed as governors of the Justice Democrats PAC late last week amid increased scrutiny of the PAC, according to filings to Washington, D.C.'s Department of Consumer and Regulatory Affairs verified Monday afternoon by an individual at the department. Justice Democrats, a far-left PAC whose members helped elect Ocasio-Cortez to Congress, has come under fire in recent weeks for transfers that the PAC made to two limited liability companies started by Chakrabarti. In addition to the money that was sent from the Justice Democrats PAC to the two entities, transfers were made from the Brand New Congress PAC, also started by Chakrabarti and other individuals involved with Justice Democrats, to the limited liability companies that totaled nearly $1 million, according to an FEC complaint filed by the National Legal and Policy Center. 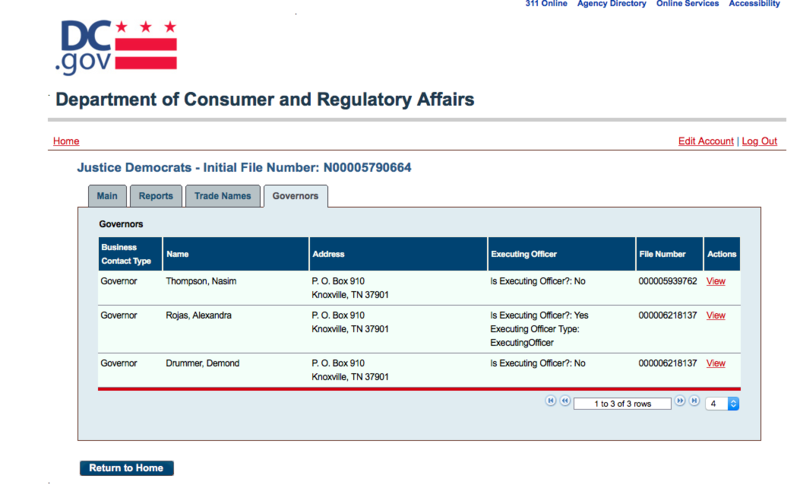 Ocasio-Cortez and Chakrabarti were later found by the Daily Caller to be listed as governors of Justice Democrats on D.C. corporate filings and remained so as recently as early March. Ocasio-Cortez did not report this to the FEC, which a former commissioner said could get them into "big trouble" with violations. Justice Democrats has since moved to replace Ocasio-Cortez and Chakrabarti as governors, according to recent filings to the department. On March 15, 2019, the group submitted a new report to D.C.'s Department of Consumer and Regulatory Affairs. While detailed reports and activity are not readily available online—a copy must be requested—Ocasio-Cortez and Chakrabarti were no longer listed as governors of the group in its most recent filings. The Washington Free Beacon confirmed Monday afternoon with an individual at the department that the activity that occurred last Friday did include an overhaul of the group's governors. 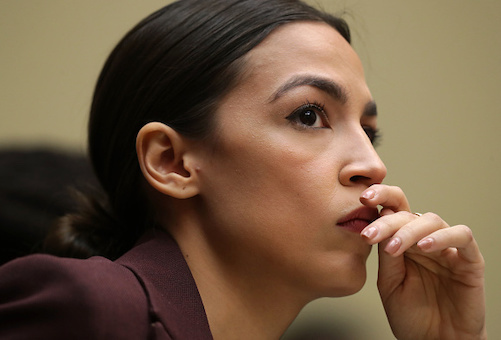 The individual at the department additionally said it was unnecessary for Justice Democrats to file a report this year because they did so in March 2018 and are on a two-year cycle, signaling that recent stories on the group and Ocasio-Cortez prompted them to make the changes. The change was first reported Monday evening by the Daily Caller. Justice Democrats did not respond to a request for comment on its swapping out of Ocasio-Cortez and Chakrabarti as its governors by press time. Chakrabarti was not the only founder of the group to benefit from the PAC. Middle Seat Consulting LLC, a Washington, D.C.-based progressive firm, received $300,000 in payments from the Justice Democrats PAC to their LLC the last cycle, the Free Beacon previously reported. Zack Exley, a cofounder of both Justice Democrats and Brand New Congress alongside Chakrabarti, cofounded Middle Seat Consulting in early 2017. Middle Seat also worked for Ocasio-Cortez's campaign and was paid $33,600 from her committee during the midterms. The firm's website does not list who is involved with the group. However, corporate D.C. filings show that Kenneth Pennington and Hector Sigala act as the firm's governors, both of whom worked alongside Chakrabarti and Exley on Sen. Bernie Sanders's (I., Vt.) 2016 presidential campaign. "They've found a way to dodge transparency," Tom Anderson, the director of the National Legal and Policy Center's (NLPC) Government Integrity Project, told the Free Beacon when asked about the payments to Middle Seat. "This is the ultimate dark money machine. If you want to go to school to learn how to make a dark money machine in politics, go to these guys because they've mastered it. And this is an example of it."